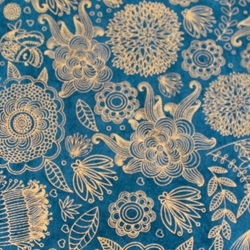 Contemporary colors and designs jump off the page with screenprinted Lokta origami paper featuring a metallic gold artistic floral design on a blue/green paper. Nepalese paper artisans hand-craft Lokta paper out of fibers from the bark of the Lokta bush and then silkscreen eye-catching designs onto the sheet. Inspired by nature patterns, the Art Deco design features intricate metallic gold flower blooms, vines and leaves popping off an eco-friendly, bright teal basebase color of this hand-made Nepalese Lokta Origami Paper.